Happy Tuesday! And welcome to the FIRST ever Tip-It Tuesday here at My Thoughts Exactly :D If you read my post yesterday and entered my giveaway then you know I asked you all which weekly segment at MTE you were most excited about. I expected most people to say Freebie Friday (who doesn't love freebies? ), but I was surprised to see that so far you're actually most excited for TODAY! That's pretty cool :) (But now the pressure is ON for good tips!!). First of all let me tell you a little about Tip-It Tuesday. Every Tuesday I will be sharing a TIP, TRICK, or TUTORIAL with you. MOST of these will probably be little tips, though I do hope to grow into doing more tutorials for you (in fact, if you have a tutorial you'd like to see, please email me! If you send it, I will make it :P). Now sometimes you might read a tip or trick and go "Uh, DUH, I knew that already," but my hope is that every Tuesday I will help SOMEBODY, and that most of the time you will be saying "Oh, COOL, why didn't I think of that?" Ok, ok, ON to the TIP! 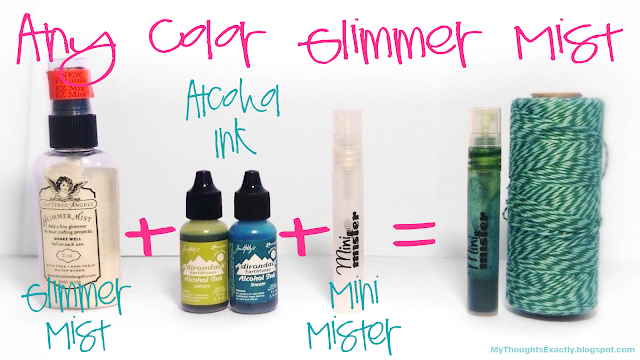 This week's tip: Make ANY color glimmer mist!! Now I know there are tutorials out there to completely make your own glimmer mist. If you're the kind of person who's willing to do that, this tip probably isn't helpful for you. Personally, I am way too lazy to do that. BUT I still love to save money, and let's face it, Glimmer Mist is pricey. PLUS I usually want my Glimmer Mist to match my project, not just any old run-of-the-mill color. 7. BAM. Glimmer Mist in ANY color you want WHEN you want it. See how beautifully the grungy (glimmer grunge?) background matches the Twisted Teal Trendy Twine?? I love it! And as you can see, once again I used a wonderfully witty stamp from Unity Stamp Company, Consider Yourself Vintage. Seriously LOVE these stamps! If you've got an awesome tip you'd like to share, I'd LOVE if you would email me! 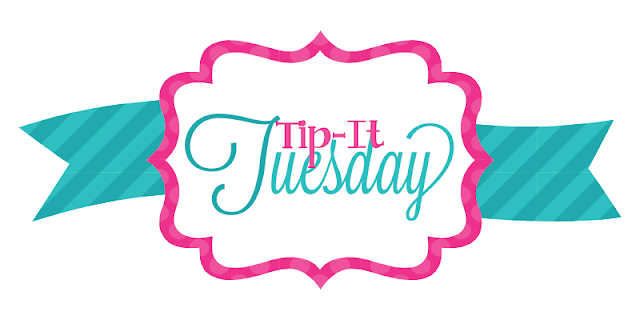 I'll be looking for Tip-It Tuesday GUEST BLOGGERS!! There's never just one person who has all the amazing ideas is there? Awesome tip Alyssa! Love the way the color matches the Trendy Twine! FAB first tip!!! love this! I just made my first spray a few days ago and love it! Aweesssoooommme! I have all this! Great card, perfectly masculine in every way! I can tell that I am going to love this blog. Great Tip, I love mist. Great idea. TFS Lovely card. Such a great design with this old car. Love that big number and colors too. The large number really grabbed my attention! Fabulous card! Love the look of that technique! I will have to try to make my own too :) TFS! Great tip! Awesome masculine card! Thank you!!! I love this! What a great way to use a vintage car!!! Gorgeous card, Alyssa!! 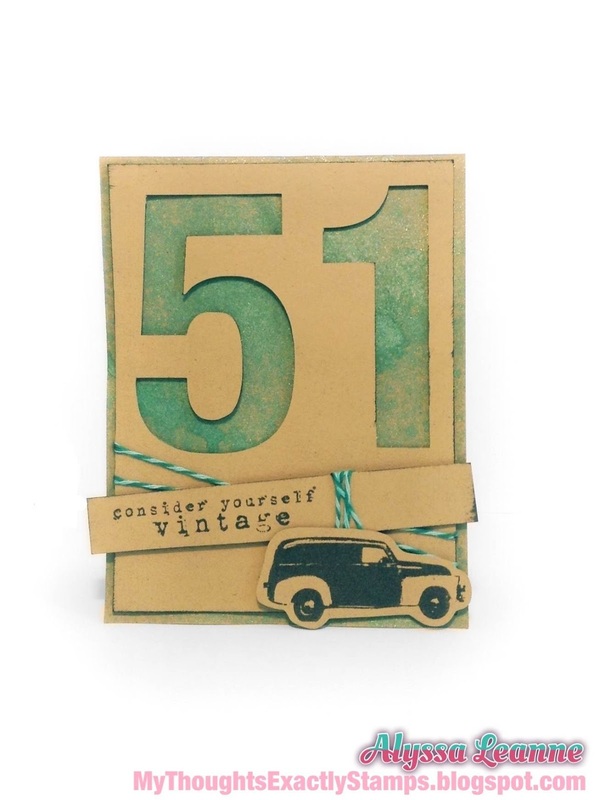 Love the vintage image and the fab design! !